Green is the color of St. Patrick’s Day, and the green shamrock has been worn since the 17th Century in celebration of the day. It is said that during St. Patrick’s life, in the 5th Century, he used the three-leaved shamrock to teach the Christian trinity to the pre-Christian Pagan and polytheistic Irish. From quiet beginnings as a religious holiday, St. Patrick’s Day has become a world-wide celebration of all things Irish, with its observance increasing in line with the increasing influence of Ireland as an economy, and recognition of Ireland’s culture and that it is a vibrant and historic country, with a long and rich heritage. The diaspora of Irish citizens, from the 18th Century on, has led to as many as 80 million people around the world who claim Irish descent, 45 million in the United States alone. So there’s a ready global population who’ll be celebrating, in one way or another, on March 17th. Roses bloom in a wide range of colors too; there’s even a green variety (Rosa chinensis ‘Viridiflora”), that’s difficult to find. Not only are they difficult to find in a florist; the rose flower is a delicate apple color, and can sometimes be camouflaged by the surrounding foliage. Chrysanthemums can also be found in a delightful lime green color, though you may have to shop around for them, or purchase them online. You should check to see if they’re grown green (through hybridization), dyed (which usually means sprayed with a green dye), or tinted (which usually means placed in green-colored water, which gets soaked up through the stem. Note: Our recommended online florist offers a “basket of dreams” floral arrangement that is a study in green of St. Patrick’s Day flowers. Same day delivery too. 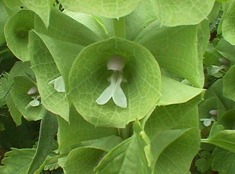 The shell flower, or Molucca Balm, is also known as Bells of Ireland, and though native to Western Asia also grows in Ireland. It is a striking and dramatic plant, growing up to 3 feet tall, with small white or pink flowers, very fragrant, almost hidden by the large green bell-shaped leaves. Alone or in an arrangement, Bells of Ireland would surely make an impression. Our favorite florist sells a bouquet with lots of greenery that includes Bells of Ireland. To bouquets or arrangements including these flowers you can also add other, maybe seasonal flowers that accentuate any blooms. Picking different shape blossoms, or supporting colors will add visual interest to the arrangement, and leaving on more greenery than usual, in the form of stems or foliage, will help to accentuate the green theme for which you’re going. Of course, you can also consider a basket of green plants, rather than cut flowers. And one final alternative is to find a glorious, elegant orchid; the cymbidium orchid, often used as wedding flowers, comes in a variety of greens, from pale to a rich, dark, grass color. Whatever your flower choice for this coming St. Patrick’s Day, celebrate safely and in style, enjoying good craic. Sláinte mhaith! Get the Luck of the Irish with the Perfect Flower for St. Patrick’s Day The Right Flowers for St. Patrick’s Day The Delicate and Exotic Orchid is Sure to Delight Which Cut Flowers Last The Longest?